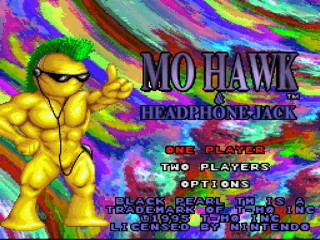 One of Black Pearl Software's only non-sports games, Mohawk and Headphone jack is a 1996 SNES platformer featuring a mobile protagonist and an extremely rotatable world. As you move up and down slopes, down is always directly below you, and so the camera spins around constantly to make that happen. Grubby 90s buttrock plays through bad snes synth the whole time, of course. Although its most meaningful contribution to gaming is probably the 10 pages of lawyer jokes hidden in the source code, the game is also notable for being the first game on SDA to require a Motion Sickness Warning. No, really, we mean it. Best time with warps: 0:29:02 by Patrick 'PJ' DiCesare on 2012-08-24. A bloopers file is also available. Best time without warps: 0:44:01 by Patrick 'PJ' DiCesare on 2012-08-18. Warps: 0:29:02 by Patrick DiCesare. Many thanks, as always, to the SDA crew for everything they do. Level 2-1: Red warp. Warps to 4-1. Level 3-1: Red warp. Warps to 5-1. Level 3-2: Red warp. Warps to 5-2. Level 4-2: Red warp. Warps to 6-2. Level 5-2: Yellow warp. Warps to 7-1. Level 6-2: Yellow warp. Warps to 7-2. Level 7-1: Green warp. Warps to final fight." This run takes the warps in 3-2, 5-2, and 7-1. In my previous run (34:17), I took the warp in 3-1 (warping to 5-1), played through 5-1 normally, and then warped again in 5-2. I assumed this was the fastest at the time, but I didn't bother testing how long it would take to warp in 3-2 instead. It turns out that since 5-1 is such an incredibly long level with a lot of pipe mazes (which you can see in my warpless run), it is around 2.5 minutes faster to skip it. This is most definitely the fastest route. There really aren't even other options. The only other idea that looks 'good' on paper is 2-1, 4-1, 4-2, 6-2, 7-2. However, the warp in 2-1 is at the end of a ridiculously long serious of pipe mazes and 7-2 is also around 2.5 minutes of pipe maze. The warp in 6-2 requires nearly every CD in the level and requires a loooot of backtracking to access. The 4-2 warp is stupid long, too. Basically, the warp is not convenient in any of these levels. This run plays only 8 levels (warpless plays 14 levels! ), and the first 5 are the exact same route as my warpless run. I was a lot pickier with keeping runs when I doing this category; I basically required perfect Tiki luck and no major errors. I had a 29:12 that was basically entirely flawless, but it missed two jumps in 5-2 that cost 8 or so seconds so I redid it. The thing about this category is that you can lose massive blocks of time really easily just because of how many CDs need to be collected in 3-2, 5-2, and 7-1. One jump in a bonus stage that is not ideal can lose as many as 8 CDs, so you have to scramble to pick up some extra CDs somewhere else. Since all of the gravity in the bonus levels is based on circles, it is sometimes hard to aim precisely where the gravity fields change. I could go on for literally hours about how silly this is to run, but nobody cares. I mentioned a lot of notes about the first five levels in my warpless run. This uses the same exact route, but I was a lot pickier. This run has a lot more minor optimizations thrown in that cost a lot of time if I miss them. My Funbot fight was maybe a second slower than it should be, but more or less everything else in the first 5 levels is great. This Tiki fight is perfect and the main reason I didn't try to improve this run any more. I had a GREAT bonus level though, so I was able to make up a lot of time. Unfortunately, I throw a lot of that away immediately when I try to get out of the water in the last section. That jump is stupidly hard to aim. I have a great level here until the section at 19:07. This section can add a TON of time. These extended jumps are really precise. You need to ride along the wall for a long time to gain enough height to make it over the wall, but if you jump too late, the game tries to clip you into the wall instead (see the third jump). On the return trip, I need to clip through all 3 walls, but sometimes the game gives me an extended jump with the wheel instead. It's so stupid. This bonus level is also the worst bonus level in the game. The CDs are just in awful spots and the gravity is really horrible. Each of the quadrants with the planets are difficult to sling yourself out of effectively (especially the third quadrant! ), and any slight different in execution there can cost several CDs. This is a pretty average run of the bonus level. I spin around the perimeter slightly longer than usual because I didn't grab enough CDs on the way. Still, I've had much worse runs of that level. Right. Final level. There is a lot of time to be saved from this run. Unfortunately, some of the maneuvers required to save like 4 seconds can cost 8+ if you mess up. I didn't go for the riskiest strats in this run. For those wondering, there's a good example at 25:18. Instead of riding that orb in the circle to grab those 5 CDs, it is possible to jump off and grab them all. Unfortunately, you will only get a usable jump if you are perfectly upright on the orb. If Mohawk is slightly off from vertical, he will get really really bad gravity and get pulled/launched somewhere undesirable. They are truly horrible platforms. Same goes for 26:25. My execution up to the bonus level is spectacular. The bonus level can add a lot of time, though. See, you need 450 CDs to open the warp vortex, and there are exactly 50 CDs in the room with the warp vortex, IIRC. Therefore, I only need to end the bonus level with 400. The more additional CDs I get before my birdman powerup expires, the more I can skip in the final room. Those CDs take significant time to collect, so it is important to grab as many as I can in the bonus level. Unfortunately, my flight in this run is abysmal and although I end with 414 CDs, I spent a lot of non-birdman time grabbing those extra CDs. To top it all off, I had a pretty bad warp vortex entrance. I've finished this level ~10 seconds faster before, but it is so so difficult to nail that bonus level. It is by far the most technically demanding part of the game. Flying while the screen rotates is horrible. Since this is a much shorter run than the warpless category, I use the riskiest and fastest strategy against Headslot. It basically just involves a lot of damage boosting to hit him as many times as possible. After taking damage, you cannot damage an enemy until you are vulnerable again, so I delay my spike attack until the very end of my invincibility period to get as many hits as I can before it wears off. Doesn't look risky and I don't know why it is, but sometimes I just get obliterated when I try that. This is a really good time, but it is certainly improvable. I really only stopped with this run because I got tired of running this game. It is so easy to lose 5 seconds on a level without making any mistakes. There are so many minor gravity slings and momentum tricks that are incredibly subtle and random that can really add up to a lot of time savings. Missing even one jump in a bonus level can add 10 seconds on its own, and getting a bad pattern on Tiki can add another 15 seconds (or as much as 30+ if it's a really bad pattern). This can probably go down to the low 28's with riskier strats and fewer major errors, but it will be really tough to do so. This is over 5 minutes faster than my old run and looks much cleaner, so that is good enough for me. I might return to this someday when I have a bit more patience, but I am very pleased with how this turned out. I hope at least someone enjoys this run. Oh, and be sure to check out the blooper reel. It is good fun. Without warps: 0:44:01 by Patrick DiCesare. Big thanks to everybody at SDA who keeps things running smoothly. There's like 20 of you and you all know who you are. ^_^ I really appreciate everything you do for us. Just as big of a thanks goes to romscout for sending me this game for the inaugural exchange of the Bad Game Exchange we started at SDA. I legitimately like playing this game and I probably wouldn't have found out about it without him (well....maybe I would have, but it would've been months later). Another huge thanks goes BlueGlass, who provided some REALLY good suggestions and feedback while I was planning this monster of a run. It was definitely nice to get a second opinion for this game. Most of all, I need to thank D.Scott Williamson for creating this game and for being incredibly generous when I contacted him. He was willing to discuss Mohawk with me despite not having played it or worked with it in like 20 years, shared some passwords, some stories about the game's conception, and even signed two copies of the game for me! I was definitely not expecting that kind of response from the game's developer. Now for some game-related stuff, I suppose. This is a really unique game, and it doens't take long to realize that. When you move, the entire world rotates around you. I am controlling NONE of the rotations manually. I can tilt the screen with L/R and I can pan it a little bit in each direction with the dpad while I move, but the rotations and gravity that you see are all hardcoded into the levels. The goal of the game is to, in short, collect CDs. Small CDs count towards the CD count and large CDs change the game music (you can switch to any previously collected CD by using the in-game CD player!). Every level has an exit and a bonus room, both of which are unlocked by collecting CDs. The bonus vortices are always purple and the end of level vortices are either pale teal for normal levels or bright blue for boss stages. I need to collect a certain number of CDs before the exit appears and the CD requirement varies per level. For instance, in level 1-1 I only need 100 CDs but in 6-1 I need 350. The collection routes can get pretty tricky. The bonus levels contain a bunch of extra CDs, extra health, and extra lives. It is never required to go to the bonus level to unlock the normal exit. CD count is displayed in the lower left of the screen. The upper left part of the screen shows how many explosion attacks you have left. Each bouncing Mohawk emblem thing is one use of the explosion. When you use it, you bounce all over the screen completely invincible and damage every target for 3 hits worth of damage. Mohawk's health (the yellow triangle) and spare lives (Mohawks!) are in the lower right. The items you collect to increase each of those look exactly the same when on the map. There are some other icons on the map that transform Mohawk into something new for a limited amount of time: a unicycle, a birdman, an amphibious creature, suction gloves (WHYYYY), or a blimp. Some of these are really useful or mandatory transformations to advance the level, but others are just disasters. -While moving vertically, if you press against a wall, you will gain velocity in whatever direction you are moving. If you are falling, you'll fall faster; if you are jumping, you will jump faster and go higher. You can reach some places you normally aren't able to with this method, or you could just use it to fall faster during long falls. It saves a significant amount of time when it is done everywhere. -When in blimp mode, you normally float very slowly. If you use the morph ball attack briefly and remain floating, your horizontal velocity will be increased drastically until blimp wears off or until you touch solid ground again. This is incredibly crucial in level 6-2, but it is also important anywhere that I use the blimp (5-1 and 7-1 are good examples). -Levels come in pairs, and the second level of each pair has a boss fight. Normally you are required to collect several CDs to spawn the exit portal (more on this later), but in boss stages the trigger for the portal is the boss's death. You'd think the bosses require CDs to spawn, but that is not true. If you know where the boss is, you can go directly to him without collecting any CDs and finish the level. Therefore, in two of the levels in this particular run, I try to avoid collecting CDs as much as possible to save some frames in the score screen afterwards. -While in the morph ball mode (when Mohawk looks like a sea urchin), you cannot collect any powerups, CDs (big or small), hit any checkpoints, enter any vortices, or collect any of the transformations. This is incredibly useful, especially in the warpless run, because I can skip the load times that the big CDs cause, I can skip detrimental transformations, and I can skip small CDs in every boss level to save some frames in the score counting screen at the end of the level. Passing through the vortices is a very important thing in some bonus levels (7-1 is a great example), but that is really only used in the any% with warps run. -Damage boosting. Definitely not a trick that is unique to this game, but this has a few very important applications in this run. In levels with fire walls, you can simply take strategic damage and run through the instant-death fire without dying. This saves literal minutes in 6-1 and some slightly less significant time in 7-1. Because of the way momentum works, it is sometimes better to just take damage from an enemy instead of killing it; when flying, the recoil from hitting an enemy can send Mohawk a very long way. Haha. That's it for advanced stuff, really. If you are really creative you can abuse the physics of curves/corners to slingshot yourself and gain a lot of momentum. I use this in level 5-1 to get the Blimp powerup faster, and I use it in a few other minor places. The problem with trying this is sometimes you'll gain TOO much speed if you use it in the wrong places and you'll either get pulled somewhere you don't want to or you'll just get launched halfway across the level. It is something to consider though. Level 7-1: Green warp. Warps to final fight. I'll discuss those a bit more in the comments for my any% with warps run. Ok, with all that aside I can move onto some individual level comments. I'm going to try to keep these short, but I can't promise anything. This run took an incredibly long time to plan and the execution is a lot more involved than the run with warps, so there are a lot of unavoidable minor mistakes. That's just the nature of the game. This level goes pretty much as planned. I grab the large CD instead of skipping it because I cannot stand the default music. It costs time but it maintains my sanity. At around 80 CDs, I briefly get caught on the wall. I was trying to use the vertical acceleration trick to skip a jump, but some walls let you partially clip if you hug the bottom and jump into them. This happens to be one of them. Boss level! Time to avoid CDs. Every 2 CDs costs 1 frame in the score tally. I collected one too many in this level. Oh well. I use the vertical acceleration trick in the last room to clip into the wall and gain a bit more time. This is my fastest Funbot kill ever! I only took 1 hit and killed him before his second attack. Ideal. At the very beginning (25 CDs), I miss a jump and land directly on an enemy. I learned later that if I jump in a slightly different spot, I can jump over that enemy and save the hit. The flight section is superb here, but I miss 2 CDs at the end so I have to collect them along the way. This route is around a second slower than if I had grabbed the 2 CDs earlier. Still very acceptible. This level is very difficult because there are some tricks that have extremely variable success rate. During the big fall at the start (5:09), it is possible to clip into the wall and ride along the ceiling slope to skip that flamethrower enemy. I don't know how it is done, but it sometimes randomly happens. The jump at 5:34 is also incredibly difficult and has a small margin of error. If you hit it perfectly it saves a few seconds, but I miss it here. I use a shortcut BlueGlass told me about to go through the spikes after I collect the birdman powerup. That saves a lot of time! Lastly, the Tiki fight is incredibly random and he can add a ridiculous amount of time to the run. This pattern is...ok. My execution was pretty lacking, but the time of the fight was pretty good. He only used the homing attack once (which is the big time sink) but he jumped around a lot. He can only be hit in the massive face, so his arms and legs block you if you aren't directly underneath or on top of him. Ideally you can just sit underneath him and pummel him, but when he jumps a lot it becomes difficult. See my fight in the warps run for a good example of perfection. This level is a fun one to run. I think the CD collection route is really efficient and shows off a lot of the level. When I grab the wheel powerup, I am kind of on a timer. At 7:45, I somehow rolled up the wall instead of passing through it. It would appear that I lost time because of it, but that is where the timer comes into play: the wheel makes Mohawk move so fast that he can't really enter into the floor at 8:01. So, while I did lose the wheel power slightly sooner than normal, I lost probably less than a second because of this. Aside from that mistake, this level went really well! My CD collection was very clean, especially in the water! Mohawk is incredibly difficult to maneuver in the water, so I am very pleased with how this went. This is a super short level because the boss is convenient placed right next to the start (if you know how to get there)! However, Octopus is another very RNG-based fight. Each tentacle has a unique hitbox, so you can just charge into one tentacle and push through the entire row to get 5 hits on Octopus instead of just hitting his face. Unfortunately, if he shoots ink as a response to your hit, you take damage and cannot hurt him. In some rare cases, he will always counter with ink and you end up either dying or losing like 30 seconds. I had really good ink luck in this fight. I almost died at the end from being too risky, so I had to use an explosion, but it fortunately didn't cost time because I have to wait for the vortex to appear anyways. It took me ages to find an effective collection route for this level because the CDs are spread out all over! I still don't know if this is the most efficient route, but I feel good about it. This route has a lot of extra CDs within grasp, which makes it easy to recover if I miss a few CDs along the way. Because of the way his momentum works, it costs a lot of time to turn around and grab a missed CD. I like to set up the routes to have some flexibility so I can just leave CDs behind if I miss them and grab a few extras later. I was well on pace with CD count for the entire level, so I never needed to grab any of the safety CDs. I ended the level with only 1 extra CD than required, which is fantastic. This is a really good run! This is my second favorite level in the game. Not only does it have the best boss name (ORBATRON! ), but it also has a really spectacular level design. I use a pretty massive sequence break to get to the boss way faster than expected. Normally you are required to use the suction gloves to climb up the wall, or take a hidden transporter to grab a birdman powerup on the other side of the stage. I opt to just jump straight into the birdman powerup hovering over death spikes and repulsion orbs, and then fly directly to the boss corridor. You are expected to use the suction gloves again in that spike shaft, but I morph ball through it and fly all the way up. My route uses the birdman to its fullest; I am allowed basically no errors during my flight through there, because if the birdman expires in the middle of my final jump at 15:25 I die. After I land from that jump, I need to make a few other very difficult jumps as vanilla Mohawk, and then make some more unintentional jumps with the wheel powerup. It probably doesn't need to be said, but this is the hardest level in the game to execute. The gravity is incredibly finicky (especially when flying up the spike shaft! ), and grabbing the initial birdman powerup is stupidly hard. If you hold right for slightly too long, you'll pass over the repulsion orbs and die. If you don't hold it long enough, you won't get through their repulsion and you'll get launched to the left into death. All of the jumps as vanilla Mohawk after birdman wears off are very tricky too, because the thin platforms have bad collision detection; if you are moving horizontally and land on those slightly off-center, you will fall right through and die. BlueGlass mentioned the idea of refreshing the birdman power at the other location and then flying even farther with the birdman, but I don't think that would be faster. It is definitely a possibility though. In this run, I do pretty well. I hesitate slightly after I lose birdman, and I miss one jump with the wheel powerup (I actually landed on it but already turned around because I thought I wasn't high enough). I lose ~5 seconds from those mistakes. However, the rest of the level is very clean and I had the best Orbatron fight ever. His pattern is entirely based on your actions, but if you get hit by the left wheel when you break them off, Orbatron passes through you to the left. This makes the other yellow wheel hit when he releases it and screws up the timing of the fight. I was able to roll under the blue wheel when it broke off (which is only possible when he is in certain positions, thanks to the contour of the room) and stay on the left side for the entire fight. Perfect battle. Also, here's a neat trick for Orbatron: if you use the explosion attack at the right time during the fight, it creates really horrible lag and it breaks the sound/music for awhile. I really like this level. It's a really cool map and this CD collection route gets to show off most of it. Unfortunately, because this level has so many pipes it ends up being one of the longest levels in the run. This is actually a really good run of this stage. I land a lot of my momentum tricks and have very little hesitation in general. I miss CD #275 and walk back to go grab it, but I should have realized that I was ahead of pace on CD count and could just grab an extra CD later. It only costs a second but it looks bad. That last room is so so scary for the same reason I mentioned for 4-2. Thin platforms have a nasty habit of letting you fall through them into fire. Another straightforward boss level. This one unfortunate because the only way to get to the boss is through some lengthy pipes. I spend more time in pipes than I do actually controlling Mohawk. While the first pipe is not necessary, it is faster than trying to run to where it normally takes me. This level is plagued with tons of enemies and other terrain hazards, which makes simply running through it impossible. So yea, three pipe trips and I'm at the boss. I don't really have a strat for him besides smash his ribcage a whole bunch. I tried actually planning a strat for that fight, but all of my strats came out to be the same time in the end. It's much more fun to just wing it in that case. This. This is the best level in the game, and my favorite. It is so incredibly obtuse that I can't help but be proud of the map designer. This level is littered with instant death fire walls which must be deactivated by the switches that are also scattered around the level. Each switch deactivates one fire wall (or sometimes no fire wall at all). For a very very long time, I didn't even think that this level could be beaten. I thought that there were some fire walls that would never be deactivated. I found out that there actually IS an intended solution, but it would take around 25 minutes to actually beat the level that way. I had to map out all the switch and fire wall locations, and how they all interacted to try to find a good route through this level...and even after I did, I noticed that the switched were sometimes not working as expected. This is a complex level. First off, I refuse to hit all the switches, so I opted to damage boost through some of the fire walls to hit switches out of order. Some of these damage boosts are pretty...creative. Haha. I think there's something like 7 damage boosts through fire walls in this level. The bad news is that some switches are "on" when the blue part is on the bottom, and others are "on" when the blue part is on the top. Sometimes when passing over a switch, it is hit multiple times (2+) and it becomes difficult to figure out if it's on or off, so I needed to memorize all the switch positions. I then realized that things still weren't working right. I think the game had taken some anti-sequence-breaking measures. If you hit some switches out of order and then die, they reset. But only some switches reset on death...and only if some other switches aren't hit. It is an incredibly difficult level to plan. The level is colossal so death abuse is the fastest way to move around, but I needed to consider what fire walls need to be disabled in order to continue and what switches reset upon death. The switches at 26:23 and 26:55 are a good example of switches that reset on death; otherwise I could death abuse out and save the time and trouble of damage boosting back out. Another issue is that if I damage boost into an area blocked off by death fire and then hit a checkpoint inside that area (i.e. at 25:06), I am trapped forever. There is no way to damage boost out of most of these areas, and I can't deathwarp out if I respawn inside. The route you see here is almost certainly the fastest possible route of this level. I've very proud of my solution. This run is nearly flawless, too. I don't make any 'mistakes', but I lose ~2 seconds from unexpected recoil off an enemy near the start. For a level that is nearly 8 minutes long, 2 seconds of mistakes is very acceptable. :( This is the worst level in the run. Before you ask, the death at the start is intentional. It is quick and gives me a nice health refill. Definitely worthwhile. The level itself isn't a big concern. The boss is the major issue. See, the boss fight is done over instant death lava. You are supposed to fight him on that thin platform and hit him once or twice as he surfs by. However, he only changes direction when he is far enough off screen. If you follow him, he won't turn around. Using the blimp momentum trick, you can actually keep up with his speed as he is surfing away from you and hit him a few times. This is an extremely unsafe strategy, because if you take damage at all during the chase, you will fall into the fire and die. Similarly, if you get a bad bounce off of him, you will fall into the fire and die. Turning into morph ball slightly too soon on your attack makes you fall into the fire and die. Nothing is safe about this. Considering the flame on his head hurts you and you need to aim at his shoulder, it is a pretty precise strategy. Oh, and the fight takes place at the end of the blimp timer, so if you don't hurry the blimp will expire and you die. In my fight, you see that I missed one of my first few hits in the chase. Fortunately there was a platform there or else I would be dead. Because of my panic there, I miscounted how many times I hit him. I'm supposed to hit him 4 times during the chase, and instead I hit him twice and got hit once. On the return trip, I'm supposed to hit him 3 times while hovering above him, but my second hit was too low so I was forced to abort and use explosion strats. From then on, spamming explosion is the fastest strat. This fight was a complete disaster (I almost died!) and cost me around 12 seconds compared to a perfect fight. A mediocre fight would be like 8 seconds faster, but I completely choked. Not happy about this. Pretty cool level. It's more or less the same concept as 6-1; there are a lot of valves that you need to hit in a certain order to proceed, but instead of fire walls we have repulsion orbs. Obviously you can't damage boost through gravity, so I am actually forced to hit all of these valves instead of going wherever I want. This actually isn't a big deal though, as the valve-hitting path grabs a lot of CDs along the way. Very convenient. This level is actually quite easy. I was still shaken up/angry about 6-2 so the beginning was not great. The rest of the level goes really well though. I take an unnecessary jump at 272 CDs to try to grab another one (whyyy) and lose like 2 seconds. Otherwise, it was a great level. More pipe mazes. No way around it. The level is literally nothing but separate rooms connected by pipes and teleporters. This is the fastest route to the boss. Unfortunately, my health is pretty poor (I like to have 3 or more to do some damage boosts) and I get really unlucky with enemy placement so this isn't as fast as it could be. Here's the deal though: at 42:32, if you hold left once you enter that teleporter, you immediately begin running out the other end and pass under the slinky guy. Every time. This time, he managed to hit me. I normally damage boost at the end of that room, but that unexpected hit made it impossible. Not a good way to lose time. Otherwise, the level goes fine. I had a really, really good Psychic Brain fight. I got hit a lot, but it didn't cost me any time at all. Fastest kill I've had on him. Ok, so this isn't the fastest strategy for this boss (see my other run for the fastest strat), but it is extremely consistent and is only a few seconds slower. I definitely don't mind sacrificing a bit of time at the end of this run. This is a really good run. Haha. I lost a large chunk of time in 6-2 and some very small chunks of time here and there in other stages. There is really no limit to the optimization in this game, as I found out when I did the run with warps. Time can get shaved off from seemingly nowhere. I could use some of the momentum tricks a bit more liberally in the later levels (the fast fall and slingshotting around corners, trying to jump over more enemies when possible, etc), but this route included all of the major applications for those. I think that a low-mid 42 minute time could be obtained with enough optimization, perfect luck, and perfect execution, but it is just impossible to have a run of this game without some errors. If a jump is slightly off of where it should be, you can end up miles away from your destination. Such is the nature of the game. This run is remarkably clean and has really good CD collection routes though, so I am very pleased with it. For the first time ever, this game finally has a complete video playthrough of every level! I hope at least one person enjoys watching this run as much as I enjoyed planning it over the several months it took me. Thanks!